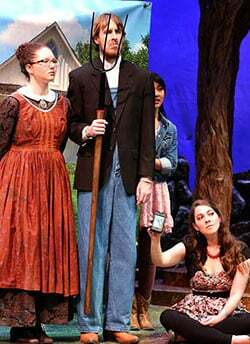 The 2015-16 Ethington Theatre Series kicks off Aug. 28 with Shakespeare’s pastoral comedy, “As You Like It,” presented by the College of Fine Arts and Production. What do a swimming pool in Tempe, Shakespeare, a stable in Mesa, bluegrass music, a stage in west Phoenix and a duke who knows his yoga have in common? Each is represented in “As You Like It,” the first production of the 2015-16 Ethington Theatre Series at Grand Canyon University. 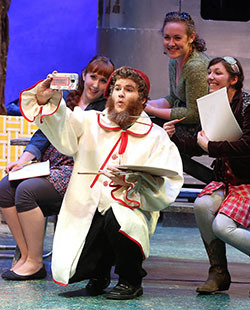 Leave it to the talented faculty, staff and students in GCU’s College of Fine Arts and Production to find a way to bring this pastoral comedy, penned by the Bard of Avon in the 17th century, to the stage in a way theatregoers might not have seen. It has long been a favorite of Claude Pensis, COFAP’s dean and the show’s director. The cast, costumes and sets of COFAP’s first performance of the year in Ethington Theater are top-notch, as always. “Its combination of lively, quirky, and vibrant characters — some of Shakespeare’s best — as well as the beautiful language woven throughout the play makes it very accessible and enjoyable,” Pensis said. This isn’t the first time he has orchestrated “As You Like It” in Ethington. But it is the first time the play’s first act — and a few added scenes — will be a film collaboration by a dozen students in COFAP’s theatre and digital film programs. The students, led by COFAP faculty member Lisa Tervo, spent part of the summer in various spots around town filming the play’s city scenes. It was a good opportunity for cross-training students in digital film and theatre, something that is available all too infrequently to arts students. ● Tickets: Free for GCU students, $5-$12 all others. Click here or call (602) 639-8880. Pensis likens the play to the film “City Slickers” in that both present the city as a “malignant and treacherous place” from which one had better flee and the country as one of peace, tranquility and restoration where lives may be made whole. 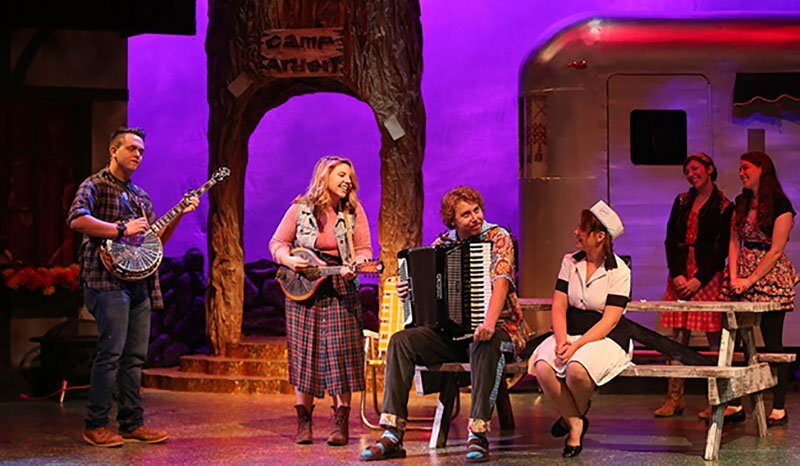 “As You Like It” is clever and fun and features four weddings and one of Shakespeare’s most famous and oft-quoted lines, “All the world’s a stage.” Ethington’s version will have bluegrass music from “The Northern Transit System,” a band with GCU connections, and a twist at the end. Ethington regulars will notice familiar student actors, junior Devaune Bohall (Celia), senior Ryan Usher (Touchstone) and senior Jeremiah Byrne (Duke Senior), among others. Pensis has double-cast the four female leads to expand the students’ opportunities and make use of COFAP’s up-and-coming talent, including juniors Amber Warner (Celia) and Laynie Nelson (Rosalind) and senior Ashley Wagaman (Rosalind). To continue the play’s contrasting themes, Bohall and Warner play Celia quite differently. Byrne has fun with his character, who, despite being banished from the city by his brother, wants to enjoy life in the Forest of Arden, practicing yoga, fishing and hugging trees. Last year, he portrayed Friar Lawrence in Ethington’s “Romeo and Juliet,” and he is finding opportunities in “As You Like It” that were not available in Shakespeare’s most famous love story. Contact Janie Magruder at (602) 639-8018 or janie.magruder@gcu.edu.